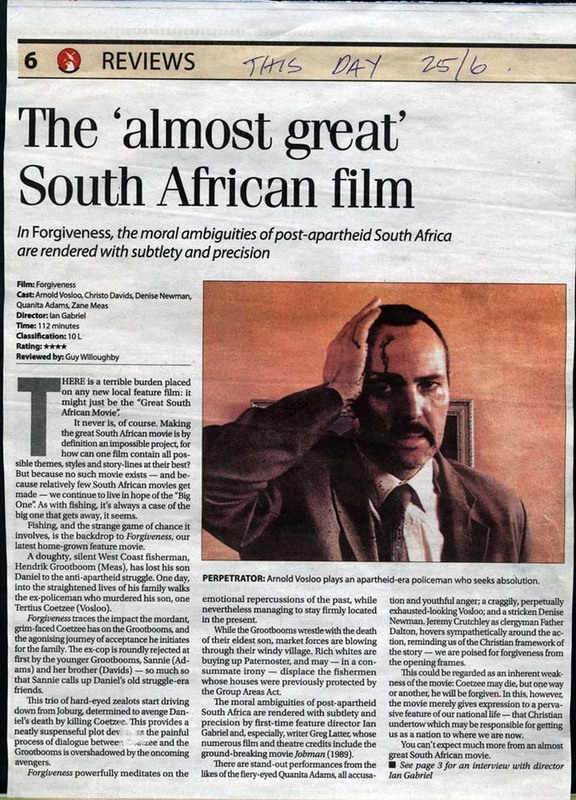 Ian Gabriel's "Forgiveness", which tells the story of a family's cathartic rebirth when confronted by the confession of a former apartheid policeman, received two awards at the Locarno International Film Festival in Switzerland this month. "Forgiveness" won the Junior Jury first prize, and also scooped the festival's Human Rights prize. 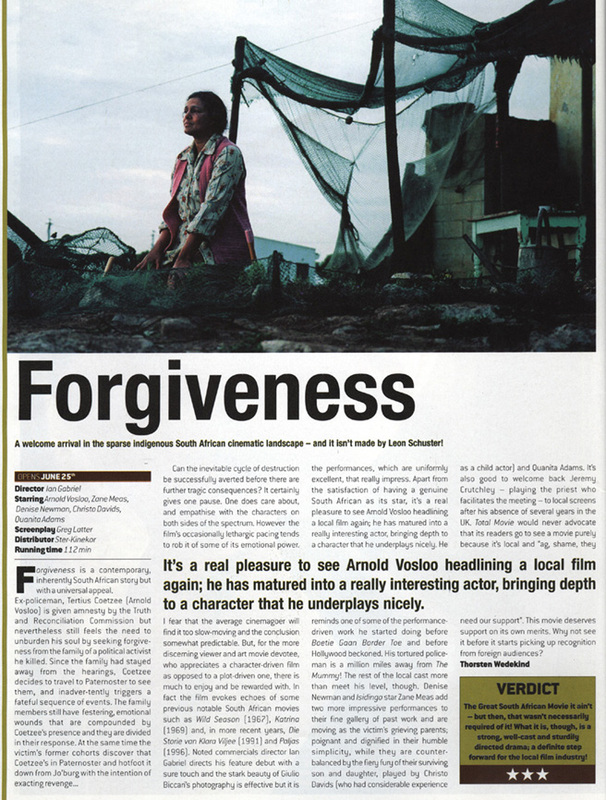 Directed by Ian Gabriel and produced by Jeremy Nathan, Joel Phiri and Cindy Gabriel, "Forgiveness" stars South African actors Arnold Vosloo, Zane Meas, Christo Davids, Quanita Adams and Denise Newman. 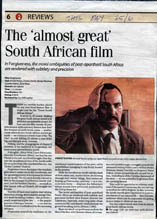 In the film, an ex-cop (played by Arnold Vosloo) granted amnesty by the Truth and Reconciliation Commission seeks out the family of one of his apartheid-era victims to ask them for forgiveness. Inclined at first to drive the cop away, the victim's sister (Quanita Adams) and her family become involved in a plot to keep the ex-cop in the small West Coast town of Paternoster in order to avenge her brother's murder. As former colleagues gather for revenge, the victim's sister uncovers a long-hidden secret. Ian Gabriel, whose background is in the advertising industry, presents an admirable directorial debut with this compelling feature film. Greg Latter's clinically crisp script has well-drawn characters and credibly harsh dialogue. Gabriel uses it well to build the tension, that mounts virtually from the outset. "With extraordinary direction and innovative cinematography, Ian Gabriel forces us to confront the complications of forgiveness", the festival's human rights jury said in a statement. "He demands that we never forget the past, in South Africa or anywhere, and inspires us to hope and live together, continuing to fight for human rights and justice." 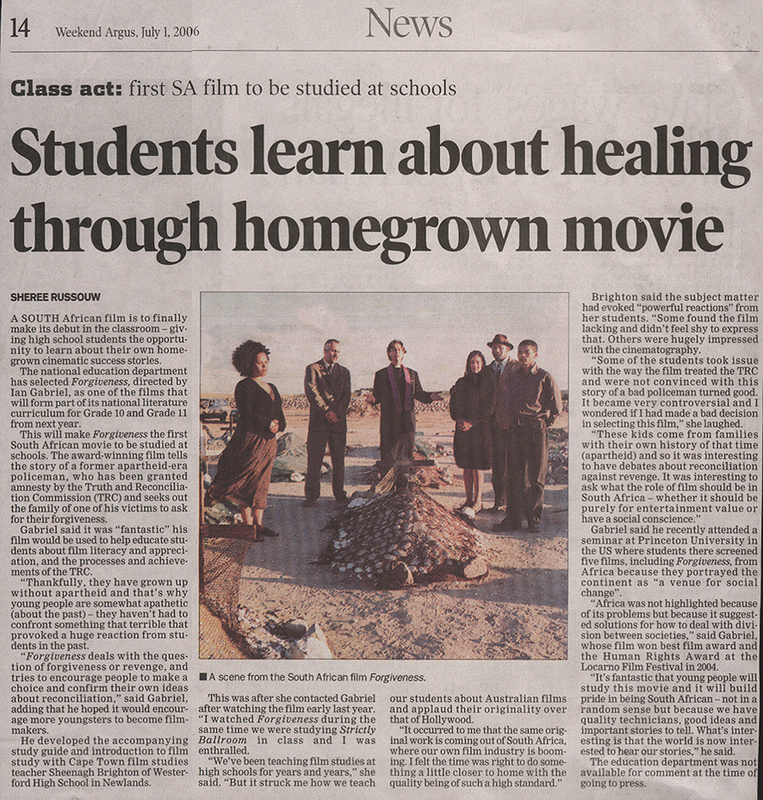 "Forgiveness" will be one of 10 South African films to feature at this year's Toronto International Film Festival, which runs from 8 to 18 September, with seven of these films making up the festival's national cinema programme, "South Africa: Ten Years Later". South African Ambassador to Switzerland Nozipho January-Bardill accepted the Locarno Human Rights Award on behalf of the filmmakers, actors and "all South Africans who are in the process of creating a human rights culture in our country. If Forgiveness brings us closer together, then it deserves to win the prize", January-Bardill said.